“Value has performed relatively poorly since the 2017 shift, but we believe challenges to the S&P 500’s dominance are mounting and resulting active opportunities away from the index are growing. At some point, this fault line will break, likely on the back of rising rates, and all investors will be reminded that the best time to diversify away from the winners is when it is most painful. The bargain of capturing long-term value may be short-term pain, but enough is eventually enough and it comes time to harvest the benefits.,” said Clearbridge Investments in its market commentary. We aren’t sure whether long-term interest rates will top 5% and value stocks outperform growth, but we follow hedge fund investor letters to understand where the markets and stocks might be going. 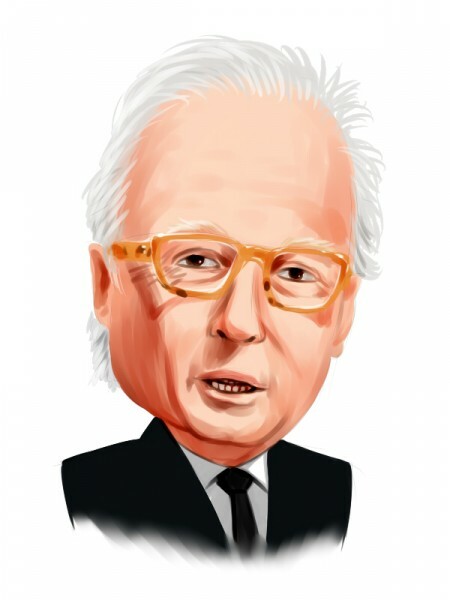 That’s why we believe it would be worthwhile to take a look at the hedge fund sentiment on Lincoln National Corporation (NYSE:LNC) in order to identify whether reputable and successful top money managers continue to believe in its potential. Lincoln National Corporation (NYSE:LNC) shares haven’t seen a lot of action during the third quarter. Overall, hedge fund sentiment was unchanged. The stock was in 33 hedge funds’ portfolios at the end of the fourth quarter of 2018. The level and the change in hedge fund popularity aren’t the only variables you need to analyze to decipher hedge funds’ perspectives. A stock may witness a boost in popularity but it may still be less popular than similarly priced stocks. That’s why at the end of this article we will examine companies such as Kohl’s Corporation (NYSE:KSS), Cboe Global Markets, Inc. (NASDAQ:CBOE), and UDR, Inc. (NYSE:UDR) to gather more data points. Let’s take a glance at the key hedge fund action surrounding Lincoln National Corporation (NYSE:LNC). How have hedgies been trading Lincoln National Corporation (NYSE:LNC)? At the end of the fourth quarter, a total of 33 of the hedge funds tracked by Insider Monkey held long positions in this stock, a change of 0% from the second quarter of 2018. 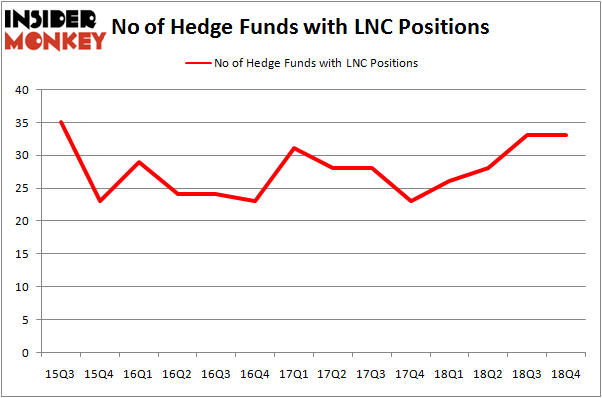 The graph below displays the number of hedge funds with bullish position in LNC over the last 14 quarters. So, let’s find out which hedge funds were among the top holders of the stock and which hedge funds were making big moves. Among these funds, Arrowstreet Capital held the most valuable stake in Lincoln National Corporation (NYSE:LNC), which was worth $86.9 million at the end of the third quarter. On the second spot was AQR Capital Management which amassed $79.9 million worth of shares. Moreover, East Side Capital (RR Partners), GLG Partners, and Millennium Management were also bullish on Lincoln National Corporation (NYSE:LNC), allocating a large percentage of their portfolios to this stock. Due to the fact that Lincoln National Corporation (NYSE:LNC) has faced a decline in interest from the aggregate hedge fund industry, logic holds that there was a specific group of hedge funds that slashed their positions entirely in the third quarter. Intriguingly, Andreas Halvorsen’s Viking Global sold off the biggest position of the 700 funds watched by Insider Monkey, valued at close to $224.2 million in stock. Alok Agrawal’s fund, Bloom Tree Partners, also sold off its stock, about $39.8 million worth. These transactions are intriguing to say the least, as aggregate hedge fund interest stayed the same (this is a bearish signal in our experience). Let’s go over hedge fund activity in other stocks similar to Lincoln National Corporation (NYSE:LNC). These stocks are Kohl’s Corporation (NYSE:KSS), Cboe Global Markets, Inc. (NASDAQ:CBOE), UDR, Inc. (NYSE:UDR), and Mid America Apartment Communities Inc (NYSE:MAA). This group of stocks’ market caps are similar to LNC’s market cap. As you can see these stocks had an average of 23 hedge funds with bullish positions and the average amount invested in these stocks was $704 million. That figure was $575 million in LNC’s case. Kohl’s Corporation (NYSE:KSS) is the most popular stock in this table. On the other hand UDR, Inc. (NYSE:UDR) is the least popular one with only 20 bullish hedge fund positions. Compared to these stocks Lincoln National Corporation (NYSE:LNC) is more popular among hedge funds. Our calculations showed that top 15 most popular stocks among hedge funds returned 19.7% through March 15th and outperformed the S&P 500 ETF (SPY) by 6.6 percentage points. Hedge funds were also right about betting on LNC as the stock returned 23% and outperformed the market as well.